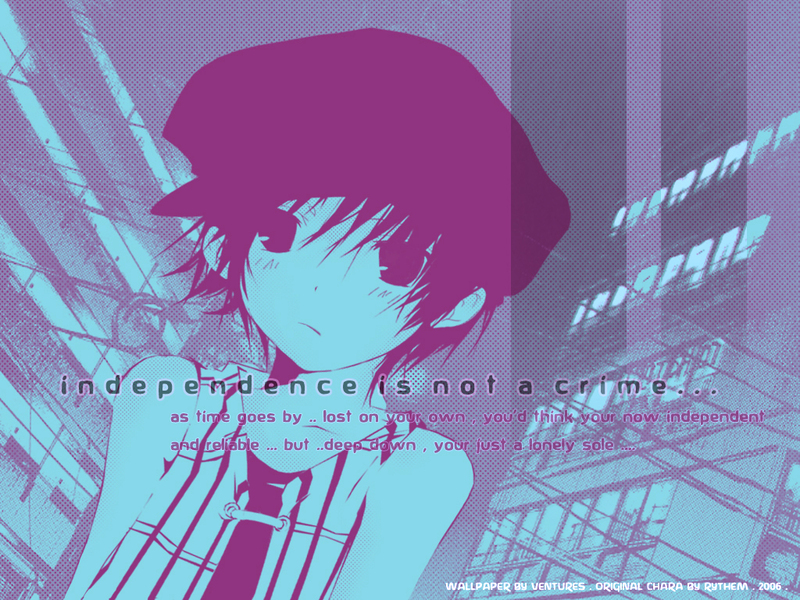 Original Wallpaper: Independent Soul . Minitokyo »	Original Wallpapers » Original Wallpaper: Independent Soul . Please full-view @___@ the thumbnail looks ridiculous . the real stuff that I wanted to write was 'you'd think you're now independent and reliable' and 'you're just a lonely soul' . main description , read plz. okay ...bg of the city-like scene is not made by me(downloaded it from here http://psychobob.xepher.net/screentonez/ ) but I added some tones and changed the colours ..
LOL Nice concept on the spelling error! XD The boy looks lonely and desolate...and the quote really fits him! ^^ Nice background too! Very unique! the background looks interesting it suits the chara. the scene is good too. woah . bikurishita . @_@ u used my drawing without my permission . T__T lmao , just kidding . that was so cute when you told about wrong typing XD i think the text is okay but those two lines writed with pink could be more in the center. you did wonderful work again and this really is little different style than your other wallies ^_^ thank you for sharing this ! lol you both funny girls... but I do admire your drawing skillz.. l33tness. I love the drawing that rythem drew and I love what you added, the city background scene. The positioning of the boy is a bit weird but I think it's okay. Love the blue too. This is actually an amazing wallpaper. :) Rythem-sama's male character looks so adorable and you have an excellent taste in combinding tones, bg and colors all together. I thought that the character suit the theme and feel of the entire wallpaper well. I see that you also added some tones to the character and (to me) they are in the right places. The texts even look good too.